LURKING within the backdrop of Liverpool's surging music clique's, a succulent sound of bulging grunge is protruding. 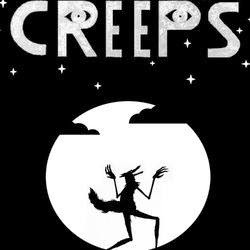 A trio entitled Creeps are the front runners of this dark, emanating mass forcing a sulky new release under our noses. Following a sense self destruction doom, two recently released tracks, 'Rivers' and 'Visions' are truly masking a hallucinatory perception of night time as we know it. Cleverly taking full advantage of the dawn of Halloween herself. Providing drones that your Nan will despise of, Rivers sticks to a mono-tonal escapism. Never truly growing larger from one note to the next there is a sense of unsigned showmanship surrounding the track, clinching the epitome of such a categorisation. Structurally, the track is well built, introducing a healthy vibration of weighty guitar coo's, the mysticism is set to grow for front-man, Adam Dickson to proceed with his numbing vocality. Laying heavy in the atmosphere, Rivers presents an unwieldy power, causing prolonged mischief in an extremely controlled form. Next track, Visions, is a little bit more textured. Warping in and out of guitar riffs, a slow beat rolls over a couple of notes in true end of the world fashion. Ridiculing every melodic song out there, Visions holds the balance of power in the grunge game, flaunting the very tip of what Creeps can create in just over four minutes. The one thing every reviewer attempts to hide away from is relating every grunge artist to Nirvana - well let us tell you, Dickson's voice is Cobain's. This track could easily be palmed off as track thirteen on Nevermind and we wouldn't batter an eyelid.